The Museum of Aviation is situated on 51 acres next to Robins Air Force Base in Warner Robins, Georgia. The facility includes four large exhibit buildings which house some of the 85 historic U.S. Air Force aircraft, missiles, cockpits and award-winning exhibits. The Museum of Aviation is the home of Georgia Aviation Hall of Fame located on the second floor of the Century of Flight Hangar. No Unsupervised Children or Youth Groups – All children and youth groups must be accompanied by supervising adults. Groups must check in at the Eagle Desk. If the group is unscheduled the Volunteer will have the group leader read and sign the Self-Guided Field Trip form. No Pets – Seeing eye and other special needs animals are permitted. During your visit to the Museum of Aviation, don’t miss your chance to ride our new Virtual Reality Simulator, located in the main Eagle building! For more information, click here. 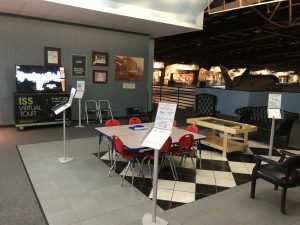 Check out our new Kid’s Zone located on the second floor of the Century of Flight hangar. There is a coloring station with a cool scavenger hunt of exhibits found at the Museum of Aviation. Take a picture of yourself with the exhibit and your colored page and tag us on social media. A new feature is the touchscreen International Space Station. Visitors can take a tour of the ISS by simply touching the screen! The ISS Virtual Tour is a unique, immersive way to engage users with the science, engineering, and beauty of the world’s only orbiting laboratory! Also in the Kid’s Zone is a construction table with building blocks for young visitors to create new structures. Parents can relax on the couch while the kids play! Manual wheelchairs are available for visitors at no charge on a first come first serve basis. All buildings are equipped with wheelchair accessible doors. Read our full 504 Plan for all accommodations below. Groups must check in at the Eagle Desk. If the group is unscheduled, the Volunteer will have the group leader read and sign the Self-Guided Field Trip form. The Museum offers downloadable resources to assist you as you guide your group through the hangars. For self-guided tours of 20 or more, please contact Candi James at 478-926-5558 or cjames@museumofaviation.org. The Guided Tour is a tour of one or more buildings at the Museum for ages 5-Adult. Guided Tours are history based tours led by exceptionally trained staff. Guided Tours last approximately 1 ½ hours. Guided Tours are scheduled for Tuesday – Saturdays and are $5 per person. The minimum number of participants required for Guided Tours is 20 and the maximum is 100. Whether you stay for a night or an entire week, hospitality and southern style can be found in Warner Robins. Convenience and value trademarks of lodging in Warner Robins- your home base for business and leisure travel. Warner Robins offers most major national hotel brands, we have hotels and inns to fit your style and preference. Please explore our local lodging and book your perfect room today! The Georgia Aviation Hall of Fame is located in the Century of Flight Hangar located within the Museum of Aviation. *The Museum of Aviation does not offer lunch or lunch arrangements. For a list of preferred caterers, click here.